Friendship was a subject on the minds of many fifteenth-century Florentines. Merchants and businessmen mused over it frequently in their journals and diaries, often proceeding with the caution expressed by Giovanni Morelli, who advised that a friend should be tested a hundred times before he was trusted once. Another wary writer noted that one enemy can cause more harm than four friends can do to help. Florence was a city of about forty thousand for most of the fifteenth century; it could be crossed on foot from east to west or north to south in half an hour or so. Its economic and civic life relied on personal connections played out face-to-face. Friends were an extension of family networks and connected through long chains of obligation. As Matteo Palmieri noted in his treatise on civil life, “Friendship is the sole link that binds cities together.”14 As in ancient Rome, a system of patron-client relationships knit the citizenry into webs of social, mercantile, and political exchange. Powerful men assisted and promoted loyal supporters (as when, for example, Lorenzo de’ Medici worked to procure good marriages for his partisans). In return, clients backed their patrons and patron’s friends—and worked to thwart their patron’s enemies. 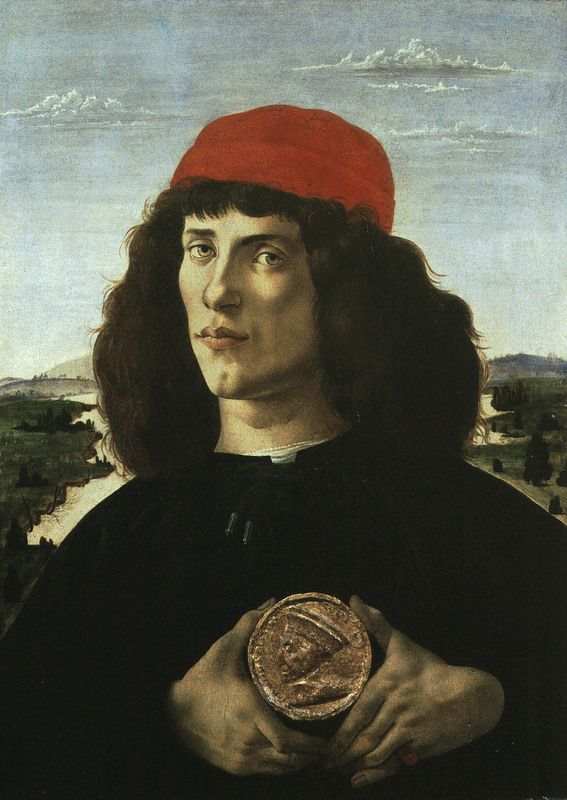 The sitter in Botticelli’s portrait, like the artist himself, was clearly a Medici partisan. He holds a stucco replica of a portrait medal made in 1465 when Cosimo de’ Medici was posthumously given the title of Pater Patriae (father of the country). It was Cosimo, a skilled merchant, banker, and politician, who established the Medici as the leading family in Florence. The young man depicted may be Bertoldo di Giovanni, a favored sculptor who lived in the Medici palace. Said by a contemporary to have been loved by Lorenzo like a member of his own family, Bertoldo designed the medal that commemorated the Pazzi conspiracy. This portrait advertises and immortalizes his Medici connection. Even when cemented through family connections, friendships could be quite volatile. Any number of circumstances—business disputes, rivalries, outside pressures—could turn a friend into an enemy. In October 1444, Leon Battista Alberti and Piero de’ Medici organized a juried rhetorical competition (certame coronario), on the nature of friendship. During recitations in Florence’s cathedral, the bonds of friendship were described as “turning like leaves / as the whim strikes us / sometimes for desire and sometimes for disdain.”15 Patronage could easily sour when the onore et utile (honor and profit) of either party was no longer served—as the Pazzi conspiracy (discussed later) illustrates. who is truly loving to all his friends . . . The apocryphal book of Tobit tells the story of Tobit of Nineveh, a poor, blind man of good faith, who sent his son Tobias to a distant city to collect money he had on deposit there. 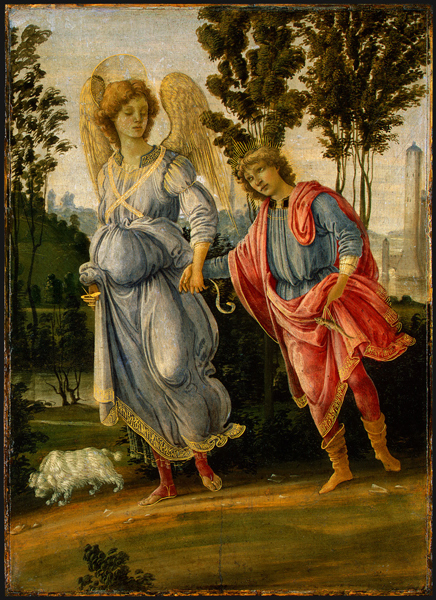 Worried about his safety, Tobit hired someone to accompany the youth, a companion who turned out to be the archangel Raphael in disguise. Their journey was a success: not only was the money retrieved, but the medicine made from a monstrous fish Tobias encountered along the way also cured his father’s blindness. The story was particularly popular in Florence, where fathers sent many sons on business to faraway lands; networks of friends and connections would aid the young travelers. Renaissance friendship was an essentially male prerogative. Men developed bonds outside the family through their active lives in the community, through political and business connections and memberships in lay confraternities and other charitable organizations. Women, more or less limited to their households, family gatherings, and occasional appearances in church, had few opportunities to cultivate adult friendships beyond their immediate relations. For some women the convent offered a chance for female companionship—and a way to live a life that was not dominated by the roles of wife and mother. True friendships between men and women must have been quite rare. One notable exception is the friendship of Michelangelo and Vittoria Colonna. Michelangelo sent this drawing to Vittoria Colonna, a gifted humanist in Rome with whom he had a long and intimate correspondence. 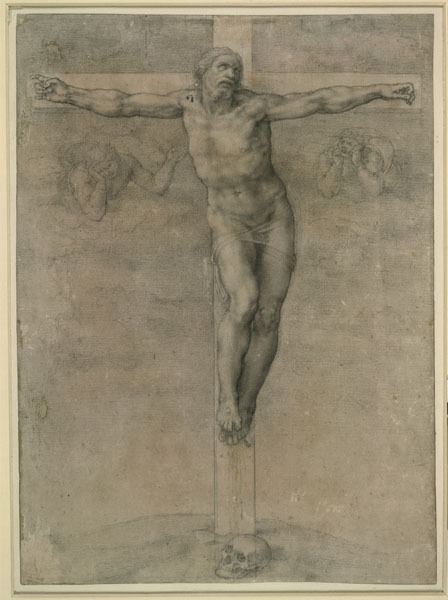 She wrote to thank him for it: “Unique master Michelangelo and my most particular friend, I have received your letter and seen the Crucifix which has certainly crucified itself in my memory more than any other picture that I have ever seen.”18 If their male-female friendship was rare, so was the nature of this gift. It and other drawings the artist gave to male friends are among the first drawings ever made as finished works of art in themselves, rather than as studies. Michelangelo created them as presentation pieces for those closest to him. After Vittoria’s death, he wrote of her as an amico—using the male, not female, form of the word.